"for Night's Candles are burnt out and jocund Day stands tiptoe on the misty Mountain Tops"
Zermatt boasts several of the world's finest hotels - many with magnificent views. Apart from luxurious rooms, mattresses fit for princesses, king size bath tubs and first class service their spas and body treatments will come as welcome relief at the end of a hard day’s walk. Five Star Tours tend to be a bit less arduous than Mountain Hut Tours as we return to Zermatt every afternoon. Following breakfast we depart for a walk. We can carry a picnic lunch or have lunch at one of the many mountain restaurants for which Zermatt is known. You can be back in your hotel in good time for afternoon tea and then wash away any aches and pains before the approach of cocktail hour. The exercise will burn off the calories so you can enjoy all the fondue, raclette and other Swiss delicacies without fear of adverse consequences. There is a great selection of restaurants in Zermatt offering a tremendous diversity of fare so you can titillate your palate with a different treat every night. Half board (which includes dinner) is an optional extra and is generally good value. Depending on which hotel you stay in this may include a ‘dine around’ feature allowing you to dine at other hotels and restaurants that participate in the deal. And to introduce added variety you can spend a couple of nights at a luxury five star hotel perched high above Zermatt at 2,222m and reached by train. 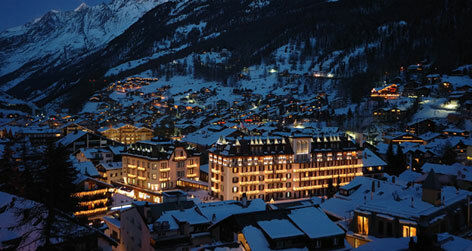 Zermatt boasts several hotels of world class comfort. Apart from luxurious living their spas and body treatments will come as welcome relief at the end of a hard day’s walk.